My design and the subsequent building of the Founders National Bank building of 1964 is, I think, a one of a kind and interesting example of the contemporary Oklahoma architectural scene in its mid-century period and as such should be kept if at all possible as part of the architectural heritage of Oklahoma City. Surely, an effort could be made made by the new owners to find some new and suitable usage of the building. 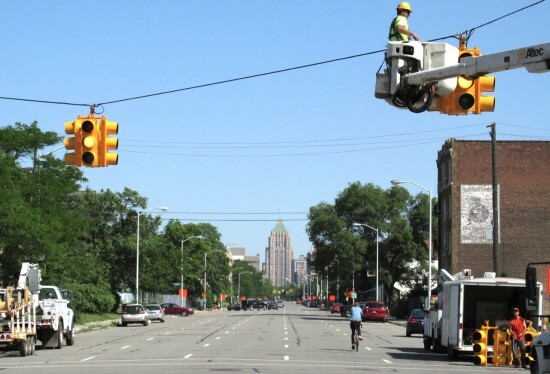 So far, Schlosser Development Corp. hasn’t released plans to redevelop the two-acre site. 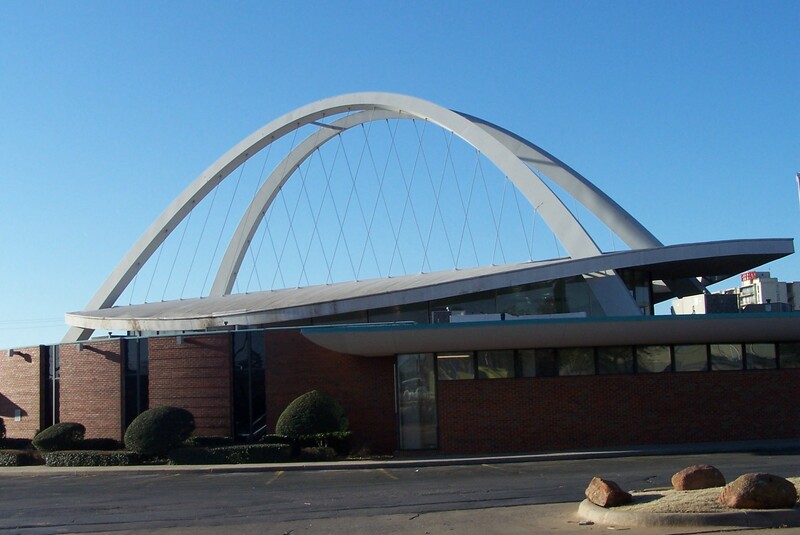 The building was one of many mid-century modern icons built in the city’s Founders District, as well as several others throughout the state of Oklahoma, including Goff’s Bavinger House, which was destroyed in 2016. While cities around the country are transforming their riverfronts to encourage recreation, Oklahoma City is taking the Oklahoma River to the next level. The seven-mile-long formerly swampy stretch of land on the edge of downtown has been brought back to life through a series of dams and structures for adventure sports including kayaking, rowing, zip lines, climbing walls, hiking trails, high speed slides, and paddle boarding. The latest addition: RIVERSPORT Rapids, a 45.2 million, 11-acre whitewater rafting and kayaking center along the river; one of many attractions in a 60-acre stretch called the Boathouse District. 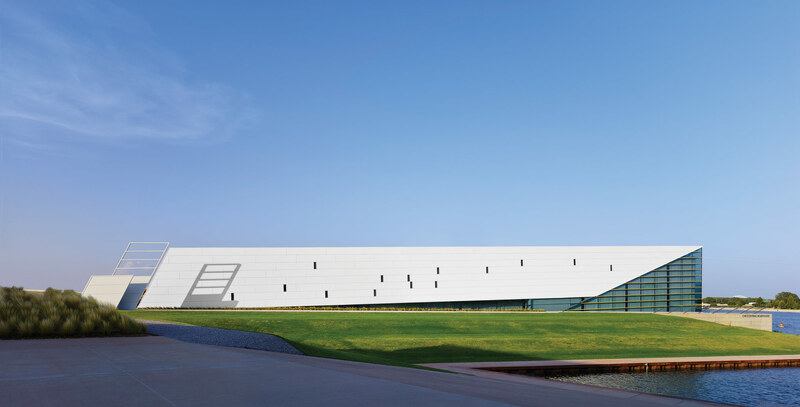 The whitewater center, engineered by Lyons, Colorado-based whitewater design firm S2o, is located just adjacent to the river. It includes two roughly 3,000-foot-long concrete channels (their angular lateral surfaces softened with plastic barriers), each stepping down about 24 feet. The average trip down takes about 10 to 15 minutes. Six 12,000-pound pumps send water from the bottom back up to the start, and large conveyor belts bring racers back up while still in their vessels. “We put a Rocky Mountain experience in the Great Plains,” S2o president Scott Shipley said. His firm also engineered the London Olympic rowing center, Dorney Lake, and the U.S. National course in Charlotte, North Carolina. The nonprofit OKC Boathouse Foundation will operate the new center, offering rafting, kayaking, and tubing, among other activities. “Oklahoma is a sports place. 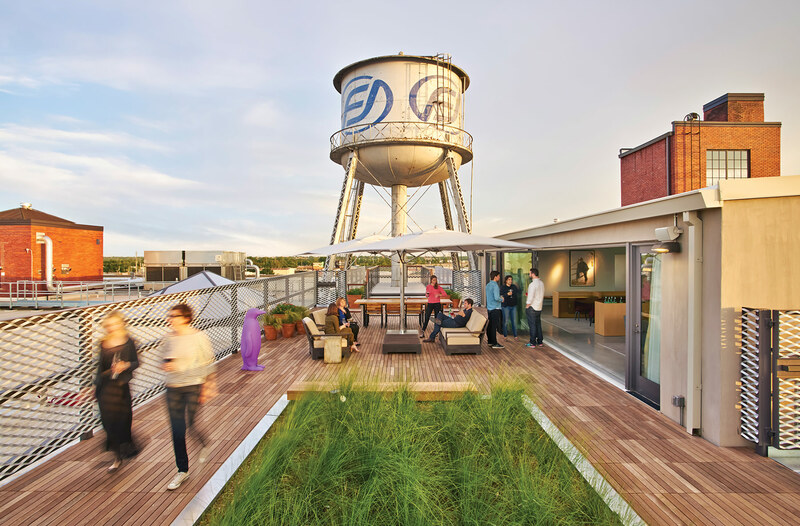 It’s really embraced this, and it’s helped create a renaissance here,” added architect Rand Elliott, whose Oklahoma City firm, Elliott + Associates, has designed and master planned the Boathouse District, a compilation of boathouses, entertainment venues, offices, and more, over the past 13 years. The rapids and the district were funded as part of MAPS 3, a one-cent sales tax initiative (already renewed four times since the early 1990s) that will give $777 million to new development citywide, with $60 million earmarked for the Oklahoma River. For years, the river, once known as the North Canadian River, was an almost dry waterbed that locals joked about mowing instead of rowing. A $53 million project completed in 2004 rejuvenated the river. Along this stretch Elliott + Associates has designed angular glass and steel buildings that line up along the river like boats about to race. They include, among other structures, the Chesapeake Boathouse, CHK Central Boathouse, Devon Boathouse, CHK Finish Line Tower, and the SandRidge Sky Trail, a zipline course that resembles a crazy straw. At night the buildings are lined with different colors of LEDs, creating a mesmerizing draw for visitors. 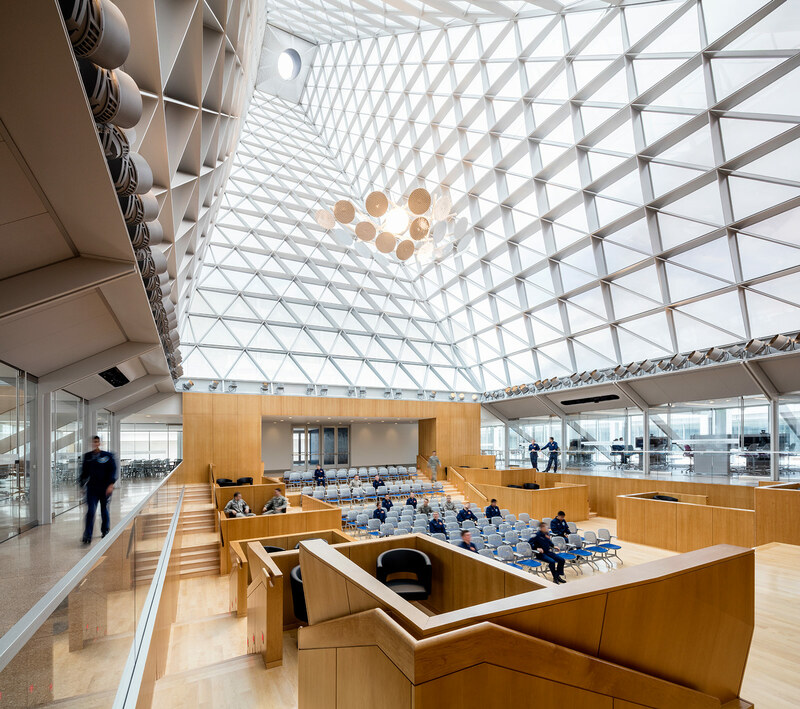 “We’ve poured our whole life and soul into this to make it an architectural masterpiece in that everything is connected yet still individual and interesting,” said Elliott. But the main event is still the water sports. 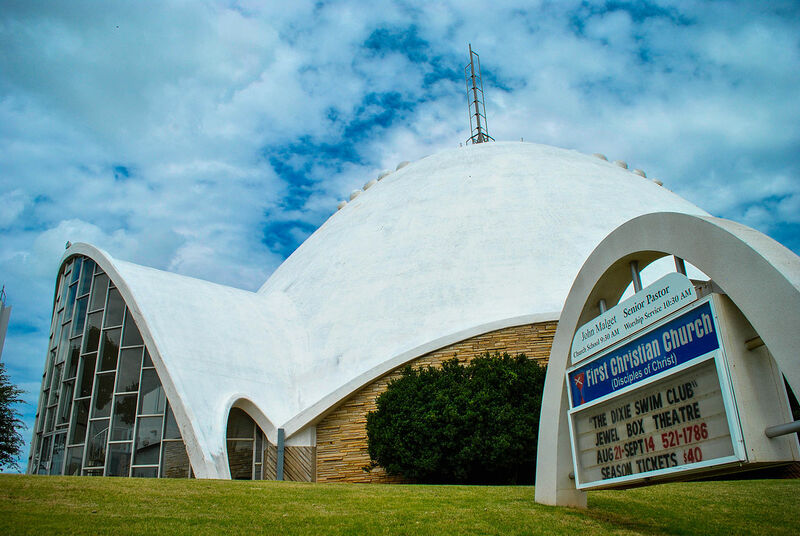 Fans of John Johansen's legendary Mummers Theater in Oklahoma City have yet another reason to shake their heads in amazement. 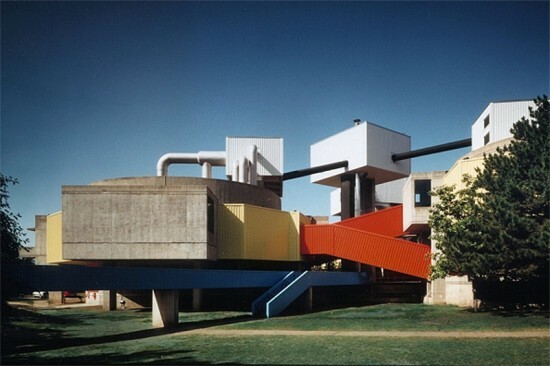 Not only is the idiosyncratic modern masterpiece set for a date with the wrecking ball, there is now a proposal for the building that may replace it. 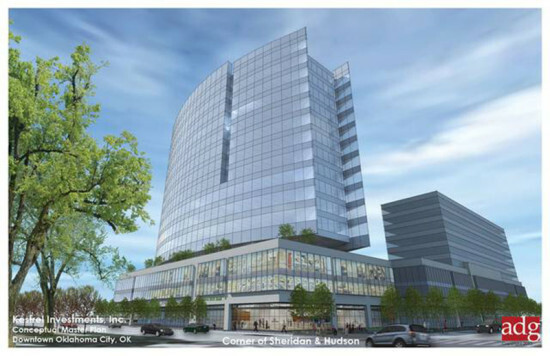 Kestrel Investments has filed an application with the Oklahoma City Planning Department to demolish Mummers—now known as Stage Center—and put in its place a 14- to 16-story tower that would become the headquarters of OGE Energy Corp. Designed by local architectural practice ADG, the $100 million proposal master plan also includes a second tower of eight-to-12 stories that would be developed separately. Both towers are located adjacent to a multi-story parking structure that includes retail and restaurants. 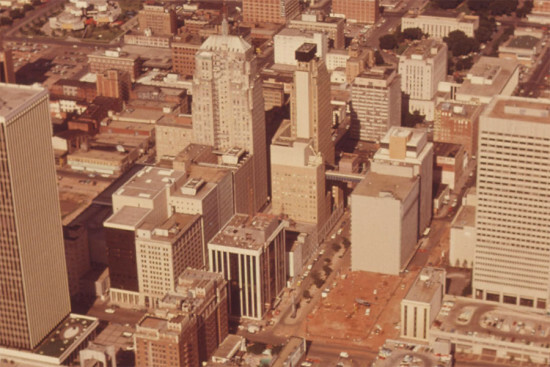 A daycare and play area will overlook Oklahoma City's Festival Square. If approved, the project could begin construction as soon as 2015 with completion of the first tower slated for 2017. 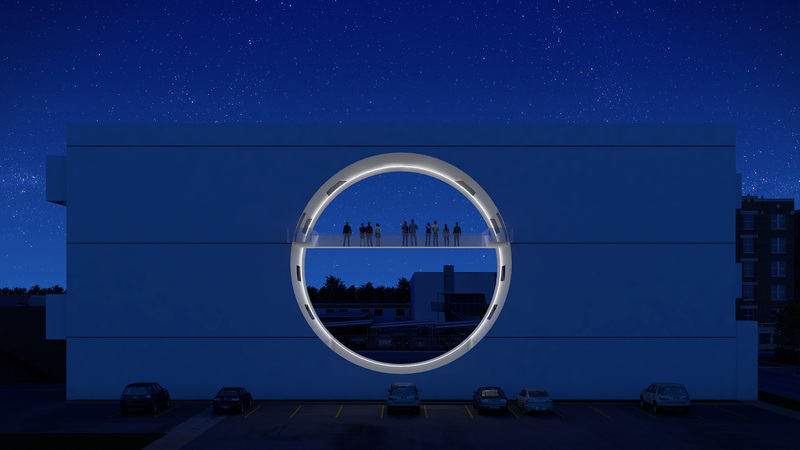 In July, Kestrel purchased the site for $4.275 million from the Kirkpatrick Center Affiliated Fund of the Oklahoma City Community Foundation, which acquired it from the Arts Council of Oklahoma City after floodwaters and vandals damaged the theater in 2010. 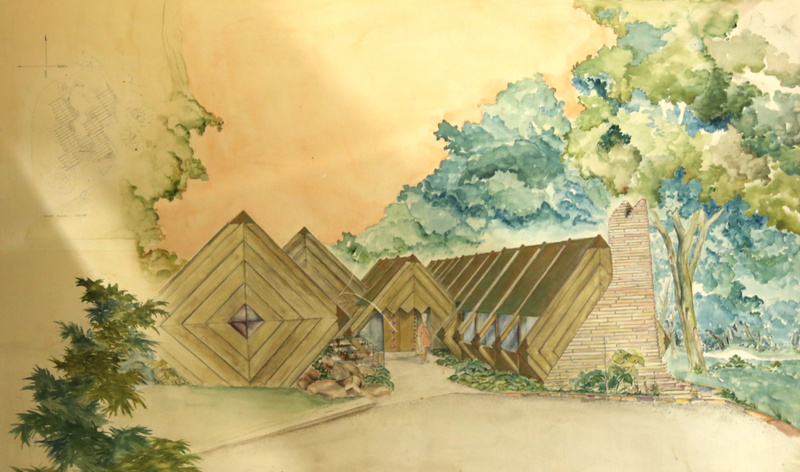 The fate of Mummers now rests in the hands of the Downtown Design Review Committee, which must approve the demolition permit before Kestrel can clear the site and start construction on its new development. But Johansen's masterpiece won't go down without a plaque, or something, in memorialis. Rainy Williams Jr., Kestrel's president, told The Oklahoman that he hopes to include a tribute to Mummers as part of the new project. "Our thought is that it will be something to recognize the architectural significance of Stage Center, and hope to do something that marks that legacy and seek ideas from the arts community as to what that might be," he said.